My husband and I just returned from a 3 night stay at the Foley House. We had the best time!!!! We were able to bring our dog and he was treated so nice, welcomed with a doggy bag! The staff, Christine and Chuck were so friendly and helpful. The cleaning staff and especially the ladies who served our breakfasts were awesome!!! The afternoon sweets and tea and the evening wine and snacks were great. This Inn keeps you well fed!!! We would love to go back sometime. The rooms are beautiful, cozy and clean! We stayed in 102, Clower Hall, a garden room with a private entrance to the patio. The location was perfect, walking distance to all the shops and restaurants. Thanks for a lovely stay…. I’m still patting myself on the back for finding this gem in beautiful, historic Savannah, GA. The Foley House Inn is stunning. My room was tastefully decorated, clean and more than comfortable. The staff was very helpful with my bags and made some great restaurant and tour recommendations. I was really impressed with all of the extra (and free!) treats and refreshments they offered in the afternoon and evening (this girl loves some shortbread). I don’t normally stay in B&Bs when I’m traveling on business, but I’ll be reconsidering that given my experience here. And maybe even looking for more Savannah clients to visit here so I can come back again and again and again. 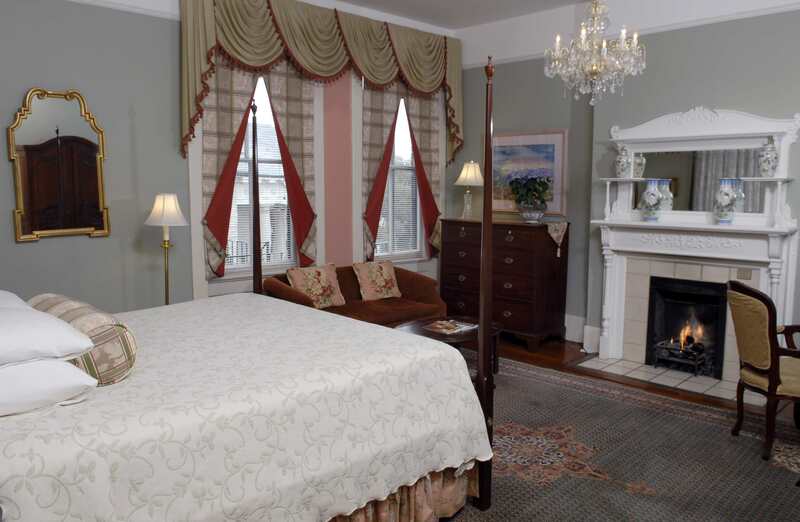 I live in Savannah and chose the Foley House Inn because it was on the Savannah St. Patrick’s Day parade route and would provide a good place to watch for my husband and I and our two small children. It was worth every penny! I loved the historic aspect of the property- the furniture and amenities look vintage but were very modern and comfortable. And my kids loved the history and hearing about the ghost of Mrs. Foley. Even though it clearly a very busy weekend, the staff was very polite and courteous throughout our stay- even when my children got a little bored and rambunctious during the rainy parade. I was disappointed at first to see that we were given a room on the ground floor because I thought we might hear some street noise, but I was pleasantly surprised. The room was pretty quiet (even during the parade) and gave us great access to the courtyard.